Quinta do Lago is the dream which entrepreneur Andre Jordan realised in the early 1970s. This 2,000-acre luxury residential development was perhaps a bit ahead of its time, but now the “Manor estate by the lake” (to which Quinta do Lago roughly translates) is well and truly established. Located fifteen minutes northwest of Faro airport, American architect William Mitchell raised the bar in terms of golf course architecture here at Quinta do Lago by importing American standard greens, tees and bunkers. The original and best course is now called the South and it opened for play in 1974. The Quinta do Lago South course is certainly the most famous in the area and it has played host to the Portuguese Open on no fewer than seven occasions with Mark McNulty and Colin Montgomerie being former title holders. Given its championship pedigree, this is also a course which will be enjoyed by the average handicap golfer. The fairways are relatively generous and the predominantly sandy but undulating ground flatters medium hitters. With umbrella pine-lined fairways, bold bunkering and a splash of water features, the South course at Quinta do Lago is certainly an eye-catching layout and one which will appeal to discerning golfers. Very nice parkland layout with some really beautiful holes at the end of the round. Water and narrow fairways are often in play and accuracy is a must. Really nice golfers destination with also the North and the Laranjal courses nearby. During my round course was in really good condition, it offers a nice start in the round with a downhill par 4 short hole, but if you cant keep the ball on the fairway you will get some trouble. But definitely a must play in the Algarve region. A little more variety than the North, the round takes a little time to get going but a very strong closing to the course. Pace of play wasn't bad considering the volume on the course, definitely superior to many Algarve courses. Just below San Lorenzo, but the best 36 hole destination in the Algarve for strong golf on a beautiful course in good condition and excellent greens.. Played this one the following day to having played the North Course and the first impression is that the course is a little bit more challenging, specially from the tee boxes where you need to move the ball in both directions. Greens are a little bit easier than North with no grain in both directions and slopes smoother, but all the same you can face some extremely fast putts in some holes. - Par 4 1st is a nice opener where you can bomb it close to the green downhill. - Tee shot on par 5 2nd demands very good direction if you wish to go for it. - 3rd is a great par 4 where lake on the left can be a problem for longer hitters. - 6th is a nice uphill dogleg left short par 4, second shot is one of the nice ones to hit. - 8th is a weak hole because from the tee box it is not that clear where to aim, but the best option is short and a mid iron as second shot. - 10th if not the one I liked most, it will be close. It plays similar to 10th at Shinnecock (yes, but with trees on both sides!) where you can bomb it down the slope and have a nice uphill wedge. - 13th is another good short one, dirvable for everybody able to hit 260yds. Then the stretch 14-18 gives you a very nice end of the round, with 15-16 being the best ones and most scenic in the 36 holes with some views of the Ocean. I am 4 rounds short on the Tour and so far this is very good! Played during very rainy period and the course was in best condition of any course we played this trip. Greens were slick, but fair (mostly). Was lined by houses, but the course seemed to provide more room than other courses in the area if you strayed a bit off line. Felt I had to hit a extra club(s) all day whether into or with the wind. Absolutely want to play here again. Having just come back from a weeks holiday in the Algarve, I have to say this was by far the best course that we played.The course was in top condition in every aspect and the setting will just take your breath away with some of the most stunning golf holes I have ever had the chance to play. It was a tough call as to whether here or San Lorenzo was best but for me and the two people I was with this just pips it. As a rule I would say that San Lorenzo has more standout holes, but Quinta South has a great feel and all the holes run so well together. 17 was my favourite hole, even though I decided to bounce of a tree. The course asks for not only accuracy but you have to be in the right place, in fact having hit good drives on the first 3 holes I found myself in trouble for not knowing the course. I would recommend playing here and we are thinking of the North and Laranjal in the next few years. 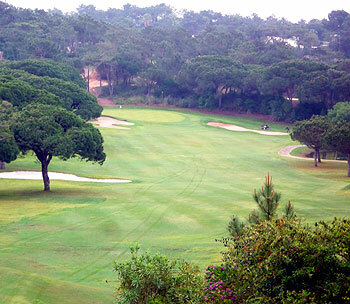 Always has been and always will be one of the special Algarve courses and is a must for any itinerary. From the opening inviting tee shot you are well aware that you are playing in a great place. There are many stand-out holes and the first for me is the par-4 3rd; 390 metres with the fairway moving slightly to the right but with the camber of land moving left, then an approach over water – quality. The 5th is a strong par-5, a couple of twists in the fairway before reaching an elevated green tucked around to the left with two fantastic bunkers protecting. The 8th is very good; 385 metres, dog-legging right but it is so easy to go left and end up playing from the tree roots that separate this hole with the 2nd. The end of the front nine has the hole that in my mind should be the 18th as the green is much nearer to the clubhouse terrace than the current final hole. Reflecting on the front nine brings a smile to my face; twists and turns and some serious change in elevation on many holes, reminiscent of what we all see every April at Augusta National. The back nine is not too shabby either; opening with the 410 metre 10th hole, which is most golfers choice of toughest par-4 on the course. The par-3 11th at around 190 metres will test most but plays a little shorter with more huge changes in height; this hole must drop 40 metres before climbing back up to the green – just get to the green and look back to the tee and you will see what I mean. The 14th tee is a great spot; one of the highest points on the course and the 383 metre SI-2 hole all in front of you – this is a very pretty part of the course, especially at the approach to the green; glance right and you see the lake that becomes the focal point for the very next hole. The 15th is the pick of the short holes; 200 metres over water with hardly any ground between the water and the green – one of the very hardest par-3’s around – that is now five times I have not made a par on the hole! Very happy to keep trying though. As mentioned earlier the 18th hole in my opinion would be better off as the 9th – I have no idea if there are any plans to swap the nines but I would like to kick-off the debate – The 18th is a very tough par-4 at 413 metres but is without a doubt the flattest hole on the course which is just a bit out of character. In direct comparison with the other two courses at the resort, the South remains my own No. 1 and that is after the major renovations on the North – Laranjal whilst very technical and on the whole very good just does not have the warmth of the beautiful South. The current rankings of #4 in the Algarve, #10 in country and #88 in Continental Europe are about right, with a little scope to improve I think.